2015 has been a busy spring & summer for us with 2 crews running back to back jobs at all times. Jasper Kahn's crew wrapped up two great projects in Montana both sponsored by Pearl Jam's Jeff Ament including a second phase at the Big Sandy Skatepark & also a fresh new bowl at the Havre, Montana Skatepark. Big Sandy Phase 2 was completed just in time for the annual Pig Roast & Skate Jam on July 27th. Lots of skaters from Montana and beyond showed up for this fun event. 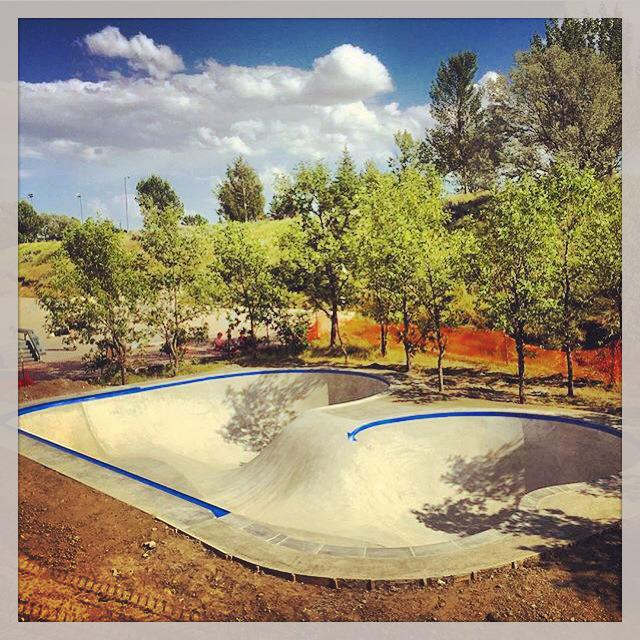 At the same time our projects in Montana were being wrapped up, Billy's crew was finishing the Clawson, Michigan Skatepark (see photo below). The Clawson skatepark features a fun flow section in the middle of the park we've been referring to as mini Thunder Park. There's also a fun track around the outside and a 'real street' path with stairs, a rail & ledges leading out of the park. The Grand Opening of the Clawson Skatepark will be held this Sunday August 9th at 2 p.m. Plus Skateboard shop will be there hosting a how-to clinic as well as food trucks, music & other vendors. It should be a really fun event for the Michigan/Detroit skate scene. Currently Jasper's crew is down south in Hernando, Mississippi. The Hernando Skates group has been working tirelessly for years to get their skatepark and we are ecstatic that it's finally happening for them. You can truly thank the efforts of Edward Pidgeon who has spear headed this effort and spent every Saturday morning for the last few years at the Hernando Farmers Market asking for donations and bringing awareness to this project. This is the first Evergreen park in the south! After Clawson Billy's crew moved to another locale in Michigan-the beautiful lakeside community of Frankfort on Lake Michigan. The skatepark location is just a few blocks from the lake. You may or may not remember the plan for the Powell Street Skate Spot in Portland but we have been dying to build this design & since the funding is still not available in Portland we decided to build it here in Michigan. (Don't worry we will design something new & equally as fun for Powell). This is the first totally symmetrical skatepark that we've ever built and we are very happy with how it's turning out. It's going to be quite the rip ride and well worth a stop if you're in this beautiful part of the state. After the completion of the Hernando, MS Skatepark Jaspers crew will head to Fort Thompson, South Dakota to build a skatepark for the Crow Creek Sioux Tribe. We're very excited to get to build on another reservation after the success of the Thunder Park on the Blackfeet Reservation in Browning, Montana. Billy's crew will head to Stevensville, Montana after Frankfort to begin construction on the Bitteroot Valleys first skatepark. Jeff Ament again will be a major donor for this project. They are still raising money for this project- head over to their website to learn more about the project and donate anything you can so we can make this skatepark the biggest and best it can possibly be!